West Ham United fan Louis Maughan visits a ground and club he should loathe visiting. But as ground hoppers, and supporters on the march to doing the 92, we have to make adjustments. 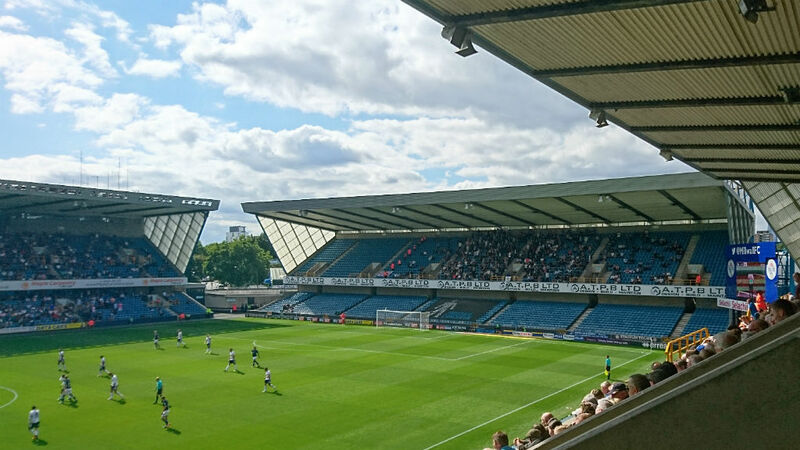 Read Louis’s experience about his visit to The New Den. As a West Ham fan, I’ve been conditioned to dislike three clubs above all others. I’m fairly familiar with Spurs, as I live in North East London. I haven’t been to Chelsea yet but due to their success, in recent times, I feel I know a bit about them. I know very little, however, about Millwall, other than their reputation. 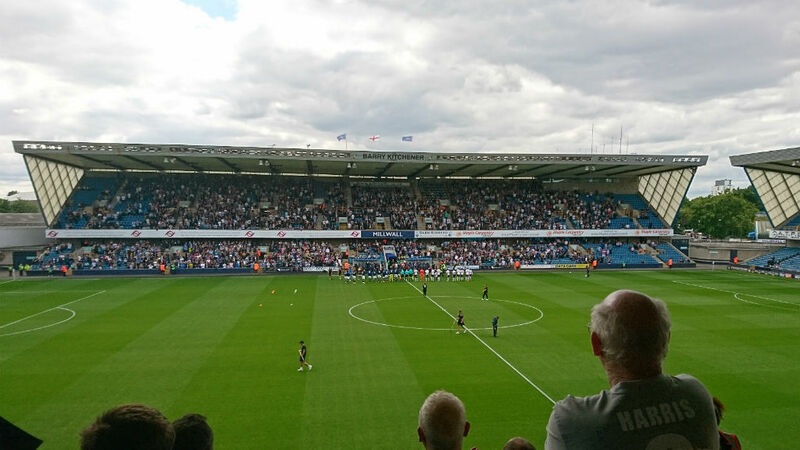 Experiencing a match day at The New Den is a rite of passage for most fans, and as a supporter of one of their rivals, I had to see it for myself. Getting some background information was tricky. I don’t know any Millwall fans or, for that matter, anyone who’d ever been to The ‘new’ Den. My dad, however, had an interesting story of a trip to the old stadium in the 80s. According to him, a group of home fans turned over a burger stand for the crime of running out of food, but that was the ‘old’ Den and a different time. Eventually, I looked at other blogs and supporter guides for my research. Getting to The New Den is pretty easy on public transport. After getting to London Bridge I made, the one-stop, journey to South Bermondsey. The train was full, but the atmosphere on board was positive and friendly. Chanting was audible from several carriages as well as another train, on the adjacent platform, that left just before us. As I arrived at South Bermondsey, I followed the crowds, but The New Den was clearly sign posted. On the way home I opted for the 20-minute walk to Canada Water tube station rather than queue at South Bermondsey. On both routes, I couldn’t help feeling like I was walking through the set of The Football Factory, or similar films, as I strolled past scrap yards, down inner-city paths, and under railway arches. 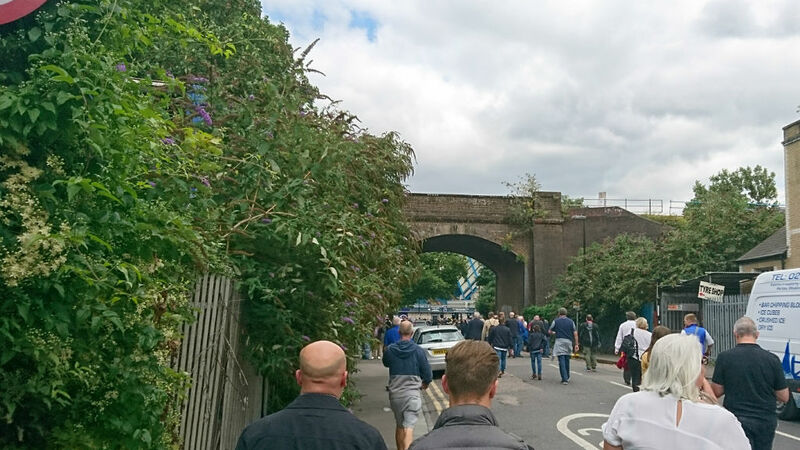 The famous railway bridge on the way to The New Den. As I approached The New Den I could easily see the four, equally sized, stands and the turnstile entrances that were clearly signed. There was also an outside bar at the Cold Blow Lane end that seemed to be popular with the regulars. My seat was in the Dockers Stand just to the left of the halfway line. The view was great and I felt on top of the action. As soon as I took my seat, the guy in the seat next door struck up a conversation. He was quite surprised Bolton hadn’t brought a few more away fans with them, and I was inclined to agree. The most raucous home fans were to my right, at the end of the Dockers Stand at The New Den. They were as close to the away supporters as possible. With the exception of the North stand, which was given to the Bolton support, The New Den was fairly full. The twelve thousand fans made the noise of a much bigger crowd and the atmosphere was good throughout. The second half was much a much more enjoyable contest. Saville scored early on for Millwall and the game came to life. For a while the atmosphere was buoyant, but the positivity was short lived as another ex-Lion, Filipe Morais, came on. The guy next to me spotted him immediately and predicted that the Portuguese would come back to haunt them. He was unerringly prophetic as Morais curled home a free-kick to equalise. Atmosphere 4/5: The crowd was loud and boisterous throughout and it felt as if there were a lot more than twelve thousand in. Location 4/5: Very easy to get to via public transport and there are a few different options for stations to arrive at and depart from. It would be an intimidating walk for away fans though. Value for money 3/5: £29 feels a little too much for a Championship game but it’s still a lot less than the London Premier League teams. Food and drink were well priced. Programme 2/5: Pretty standard content. Disappointed there was no update on the Council purchase order to buy the land around the stadium considering it was the first home game of the season. Character 3/5: The stands at The New Den are very similar and typical of ‘90s’ stadia, but the surroundings add plenty of character. Stewarding 5/5: The stewards were very friendly and helpful and seemed to have a very good rapport with the regular fans. Overall 3.5/5: I really enjoyed the overall experience even if the game could have been a little better. I would imagine the experience of an away fan, however, might be a little different. You can keep up with Louis’ 92 on his the92.net profile and on Twitter @louismaughan.